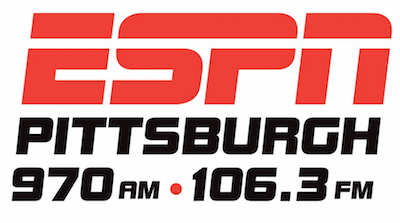 iHeartMedia Sports “970 ESPN” WBGG Pittsburgh has launched its 106.3 W292DH translator just in time for the start of the NFL season. While WBGG programs seven hours of local programming, its AM signal makes it an also-ran compared to CBS’ “93.7 The Fan” KDKA-FM. WBGG registered a mere 0.2 share in the August 2015 Nielsen Audio ratings compared to KDKA-FM’s 7.5. W292DH held a Construction Permit to operate with 250 watts at 165 meters, but due to a Notice of Presumed Hazard issued by the FAA, translator owner Educational Media Foundation applied for an STA to operate with 46 watts that was denied by the FCC in late August. With the FCC database currently down for maintenance we are unable to currently see how W292DH gained approval to sign-on, but will update when the database returns on Thursday. I wish iHeart the best of luck with the signal, since KDKA-FM will continue to dominate in the ratings, just like what sister station WDSY is doing against WPGB in the Country race. According to PBRTV’s post, W292DH’s “signal is narrow to the east and west” because of both WLCY and WCDK.